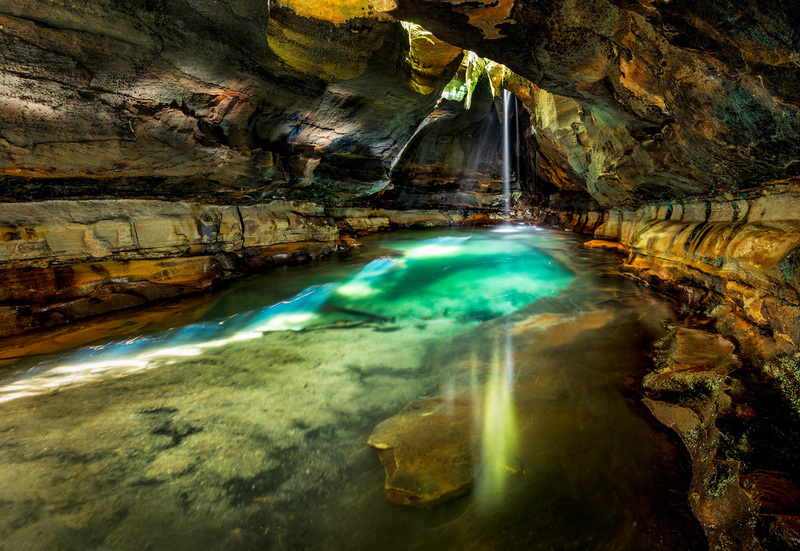 This idyllic pool is hidden away inside of a canyon in the Blue Mountains of Australia. To get this image I had to canyon for an hour before abseiling down the waterfall you see in this picture. After pulling my ropes down from above and effectively leaving me with no chance of retreat. I set my tripod up within the stream and then took a series of 4 separate panoramic images, which had to be joined together to form this very large and detailed print. Each of these individual photos took 60 seconds giving me ample time to ponder on how the water has slowly carved the rock away to form this almost subway tunnel, complete with a skylight and a waterfall. The skylight lets in this amazing streaky sun light which has a green hue from all of the green foliage above.